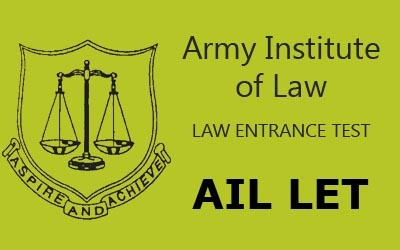 The Army Institute of Law (AIL) was established in July 1999 by the Indian Army under the aegis of the Army Welfare Education Society (AWES). This institution is located in Patiala and is affiliated to the Punjabi University. Its main objective is to impart high quality legal education through its Law courses. 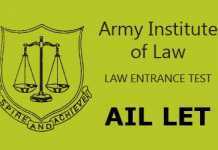 Army Institute of Law (AIL) Law Entrance Test (LET) releases its application form in the month of March. Interested candidates will be able to apply through online procedure on the official website. The AIL conducts the entrance examination every year for the admission of the students into its Law courses. The institute ensures 100% placement for the students after the completion of the course. It offers both undergraduate and postgraduate programme in Law. It also provide the scholarships to the students during the course by awarding the cash price to the students who do well in the semesters. The AIL LET generally held in the month of the July. Every year number of students appear for this entrance examination. Interested candidates will be able to apply for the examination from the official website of the Army Institute of Law (AIL) at armyinstituteoflaw.org The process to fill the application form will be completely online process, there will be no offline mode. The admission given in the institute shall be based on the marks obtained in the Law Entrance Test of AIL Entrance Test. The Law Entrance Test for Army Institute of Law is only for the Wards of Army Personnel, Punjab Resident Civil Category and All India Civil Category. LL.M (One Year Course) LLM is a one year integrated programme in which the students will get the depth knowledge in the field of law with specializations. Student will be awarded with the Post Graduate degree after the completion of the course. Candidates who will appear in 10+2 examination in March/April are allowed to appear in the entrance examination. If in case candidate fails in the qualifying examination then their admission will be cancelled. 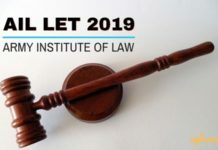 As per the norms of the Punjabi University, candidates with minimum pass percentage of 55% marks in the BA LLB (5 years) or LLB (3 years) will be eligible to apply for the AIL LET LLM. Children of All India Civil Category other than Punjab Residents- Candidates applying under this category must be citizen of India who intend to settle permanently in India and have obtained the citizenship before taking admission in AIL. Children of Punjab Residents Civil Category– To claim the benefit under this category Candidate must mention in the application form that he or she belongs to the Punjab Residents Civil category. In this regard candidate have to submit the required documents along with the application form. Given below is the examination pattern for the students who will apply for the BA LLB programme in AIL LET. There will be four sections in the question paper and the questions will be based on the level of 12th standard. All the questions will be of objective type (Multiple Choice Questions). The paper will be in english language only with total 200 questions, each section containing 50 questions. The selection of the candidates to the Institute will be done on the basis of the marks obtained by the candidate in the entrance examination. After the declaration of the result of AIL LET, first 100 candidates in order of merit will be of Army Category will be called for the seat allotment process to fill the 60 seats and 20 candidates in order of merit of All India Civil Category will be called to fill the the 4 seats. Whereas, admission to the Punjab category students under All India Civil Category will be based on the merit of class 12th. my husband in Indian Air Force, can my daughter apply in army quota?